Today is my first Prima reveal. I wanted to thank everyone who congratulated me and left me some love on my blog, Facebook and personal emails. You guys rock my world and I’m extremely grateful to you all. 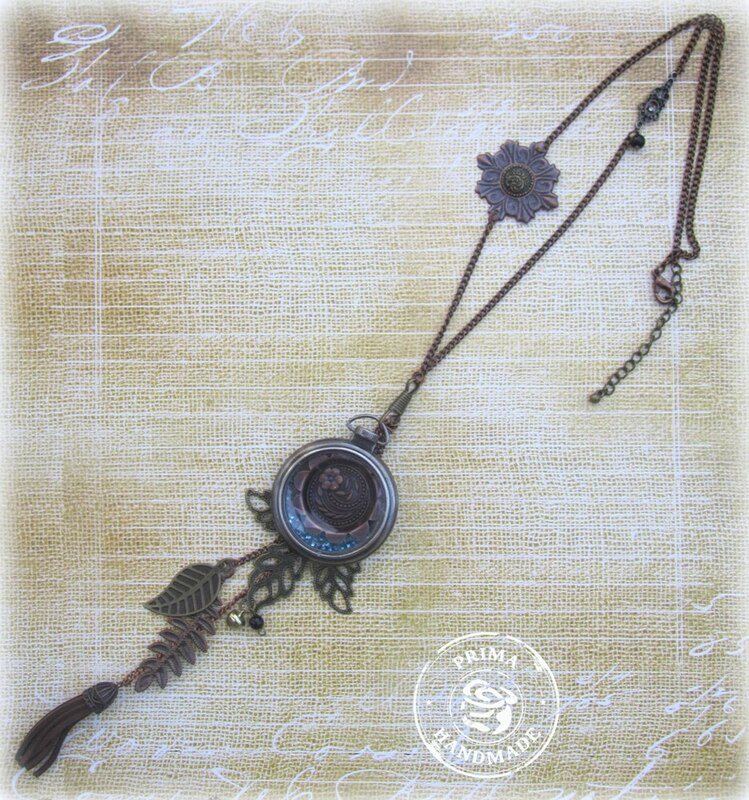 Finnabair has released an amazing new collection: Vintage Vanity and Elementals and I’ve created a necklace using some of the mechanical elements from this collection. As soon as I saw these metal treasures from the Vintage Vanity and Elementals collection I knew I had to make a necklace out of them. I fell in love with the Mechanicals fob watch case and I knew I wanted to fill it in with treasures. 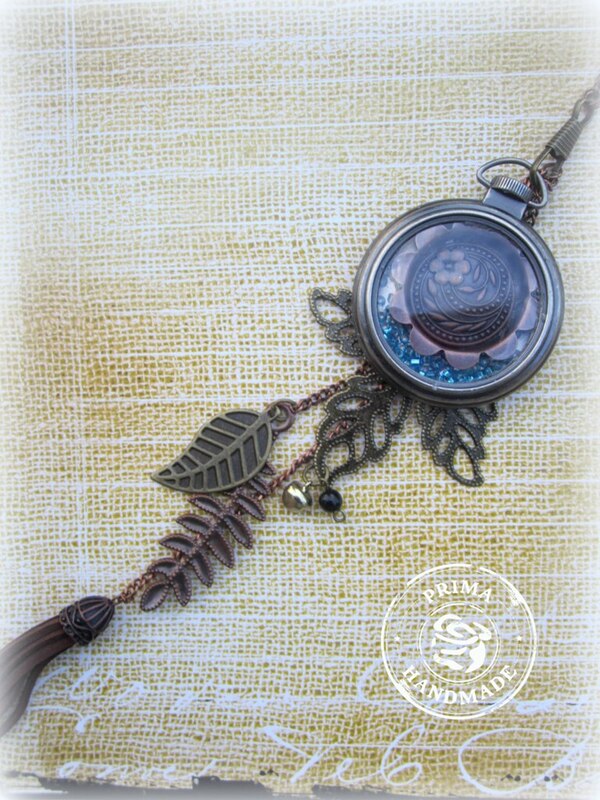 I used to design necklaces so I had a copper colored chain in my stash that matched perfectly with the metal trinkets. 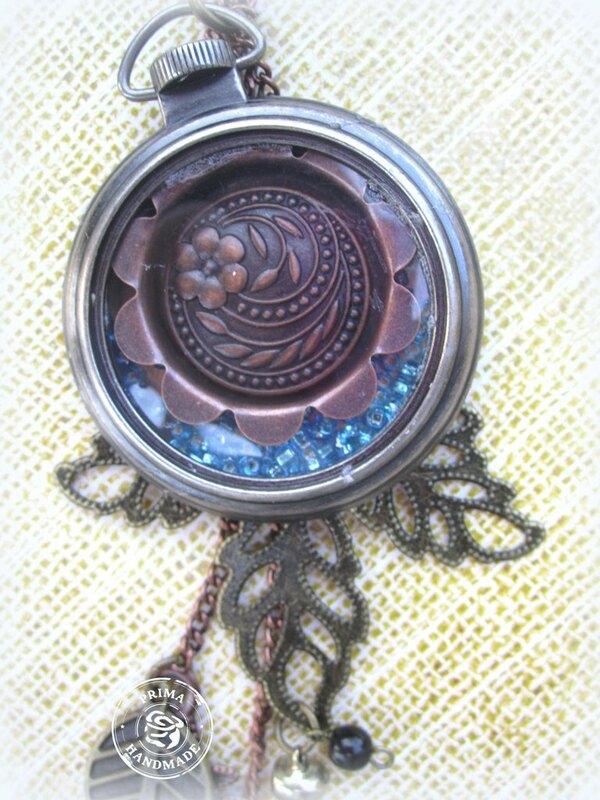 I filled the empty case with a flower mechanical and glued a medallion inside of it. Then I filled the rest of the case with blue beads. Finally I cut a circle out of recycled plastic packaging and sealed the top. I used different chain lengths to attach Mechanical elements and have them dangle down the necklace. I attached them at different lengths to add some height and texture to the look. other materials: blue beads, copper chain, clasp, loops, plastic packaging and glue. Thank you so much for visiting me today!! Love this Keren!! Great piece of wearable art!! Let me just send you my address, lol! oh this is so unique.love it! Wow! This is sooo outta the box, & simply divine…stunning debut, Miss K!!!!!!!!!!!! Just seen this at Prima, and it's absolutely stunning. How awesome is this, Keren! Congratulations once again! This is stunning!! I loveeeeeeeee it!!! Absolutely stunning first project for Prima. Wow you are a lady of many talents, this looks stunning, with such elegance too!! Wow! This is soooooooooooo neat! <3! now I'm letting you in on a little something … I could and would wear that … just saying … it's absolutely fabulous … genius actually !!! !